A pair of Damascene lacquered iron and gold hair combs of striped design, in 22k. Angela Cummings for Tiffany & Co.
A gold necklace comprised of opposing circular links, in 18k. 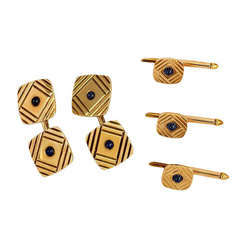 Paloma Picasso for Tiffany & Co.
A gold and cabochon sapphire dress set with geometric embossing, comprising a pair of cufflinks and three shirt studs, in 14k.